We are cautiously optimistic about sweet corn. We plant every year, but rarely harvest any. We tried Country Gentleman this year. Planted with a plastic layer surrounding each stalk for weed suppression. 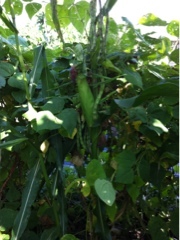 They have grown to huge sizes and there are ears of corn on every stalk. Now waiting for the silk to begin to dry up, as that is the indicator the corn itself is mature and ready. Country Gentleman is a shoe peg corn. The kernels are randomly placed on the ear, not in neat rows. We planted Silver Queen corn too. Much more uniform in appearance. Bigger kernels. Growing as we do without chemicals, corn is a challenge. We have watched, waited, hoped for a harvest. Country Gentleman has beautiful red silks on every ear of corn, a beautiful sight in a sea of green. The Silver Queen corn is covered in stink bugs. The plants are stunted and full of stink bugs and corn worms. Very buggy and nothing that looks like we would want to eat. We are pulling for you Country Gentleman. Keep growing chemical free, keep those bugs at bay, make those out of the norm looking ears of corn, we can't wait to taste them! And those purple beans, rattlesnake beans, are also very tasty. Easy to locate and pick in all that green. Summer squash in coming in now too. Tomatoes, a little lettuce again, a few radishes. The larger winter squash has formed and is maturing. It's on!